Art historian Bernard Smith (1916-2011) observed the changing dynamic of Arthur Boyd’s painting as his career burgeoned from its early stages. ‘Following his social realist phase Boyd turned, about 1943-44 to paintings that embodied figures in landscapes. He continued to use a dark, restricted palette , but developed freer and more expressive brushwork breaking his canvases into expressive textured surfaces’.1 These early signs of a dark, inhabited earth and restless brushwork remain well into following decades. By the time Lovers and Ram was painted, around 1985, Boyd’s ideas of an ‘impossible union’2 had matured and had progressed through several important series including the works now known as the Bride series, painted in the 1950s, and the subject of a major exhibition and catalogue organised by the Heide Museum of Modern Art in 2014. This series, which Boyd started in 1954, and which was officially given the title Love, Marriage, and Death of a Half-Caste involved complex themes of mixed marriage, forbidden love, estrangement, and the ties that bind. Throughout his career Boyd returned to the concept of lovers, brought together by mysterious forces and their struggle to make sense of themselves as individuals and as a couple in an environment that works against them. Lovers and Ram is suffused with a strange uplifting melancholy, a sort of mood that is hard to pin down. On the one hand, we see the lover’s tangle of legs, a clumsy hand that appears to hesitate in mid act, passionate eyes. 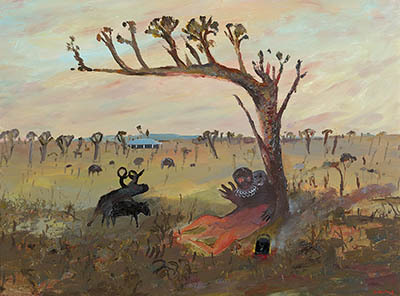 An air of poignant tenderness, enhanced by the overhanging tree, is moderated by other elements: the distant house, the rutting animals and the oddly domestic touch of practicality in the form of the campfire with billy - all of which contribute to the complicated feeling of self-consciousness. The lovers are inflamed but are also aware of the nature of their act and that is has consequences. The backdrop for these events is a sparse, but far from barren landscape that could only be the Australian bush. Boyd provides a bower for his lovers in the form of a curious, half-stunted tree that provides a scant modicum of shelter and privacy while in fact drawing attention to the couple. To the left, the beast goes about its business of generating. Lovers and Ram also includes, like all of Boyd’s work, layers of personal significance. Often there is a strong sense that Boyd, more so than any other artist of his generation, used his art as a means of communicating directly with his audience in an intimate way. There is also the sense he uses paint as a means of exorcising demons. Although the personalities depicted in his tableaux shift and attempts at confirming the true identities of his dramatis personae are repelled, his work invites individual interpretation and close examination, particularly inasmuch as it is autobiographical. The edginess of Boyd’s art is understandable: he is laying bare to us all the events of his own life, his own innermost thoughts, his own circumstances and his family history. Typically Boyd sought to depict the nature of sexuality through the device of a ram-like horned beast that appears as a counterpart to Man in many of Boyd’s paintings. The beast wrestles with Man and seduces females. Boyd may have used the ram as a device to depict one side of his own nature because it conveys something of the conflict between free action, self-discipline and destiny that may have been driving forces in his own mind. In this respect Boyd’s use of the device recalls Picasso’s use of Minotaur to demonstrate how an essential life force, which being neither positive nor negative, is in fact actively neutral or essentially an abstract and yet a critical component in the act of the creation of art.